Located on the first floor, this spacious, open and covered event space offers a grill, mini-kitchen and restrooms. 10 round “picnic” style tables are traditionally set up throughout the Pavilion. These can be removed if necessary, and replaced by banquet tables. A children’s playground is also located adjacent to the Pavilion area, making it a perfect space to host a summer barbeque or birthday party. Shades come down to cover the archways in case of inclement weather. Located on the second floor, this event space can hold up to 160 people. The Banquet Hall opens onto grand terrace with a spectacular view of the beach. Holding up to 35 people, this is the perfect space to put some high tops or action stations for a cocktail reception. Inside is a full-service catering kitchen, bar area, restrooms and a beautiful piano. 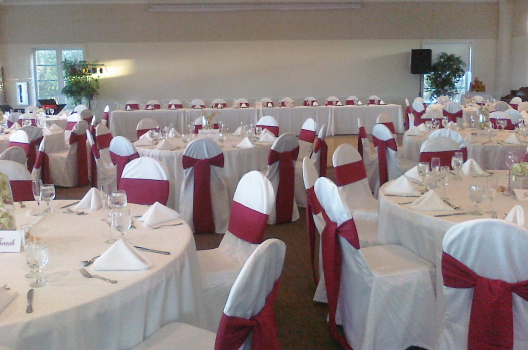 Set up options include banquet chairs (covering optional), 60” round banquet tables (holds 8 – 10 people), 6’ rectangular banquet tables, round bistro tables (high tops), and square card tables. Additional items available for your use include a stage (additional cost), dance floor and projection screen. Aaron’s Catering of the Palm Beaches creates customized packages with a complete array of services, including menus, photography, entertainment, décor and more for every occasion. Palm Beach Shores is an unforgettable setting, and truly one of South Florida’s most well kept secrets. And it’s waiting just for you!! Contact Julie Larson at 561.792.9292 for more information and to begin planning your fabulous event!